It’s Pi Day! But in the world of food bloggers, it’s more like Pie Day! 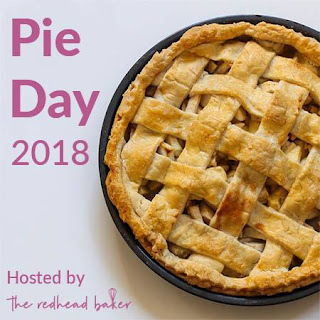 Whether you celebrate the day with 3.14 or a slice of tasty pie is up to you, but of course I had to make a recipe and share it with you for today. 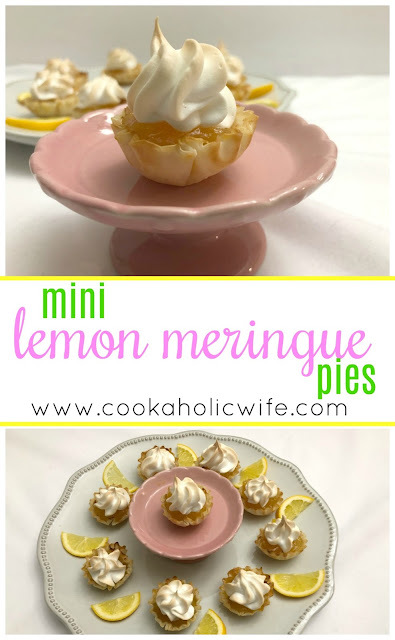 I knew right away I wanted to make a lemon meringue pie. I can’t believe I’ve been blogging for nearly a decade and have never made one before. I’ve made pie crust, lemon curd and meringue topping but never once have all of those things come together to make a pie, until today. Coleen of The Redheaded Baker is hosting this Pi(e) Day event! Scroll down to see what the other bloggers have made. While I knew what I wanted to make, I kept putting off making it because the pie needs to be refrigerated and the eating plan I’m doing currently takes up 98% of the fridge, leaving a mere 2% for my husband. So this past weekend, I knew I was either making the pie or backing out of the event, regardless of available fridge space. 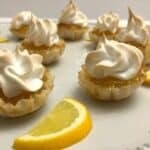 After baking, cooling and refrigerating I went to take a picture and unfortunately found that somehow the middle of the meringue and lemon curd had turned into soup and had dissolved the crust. I’m not even sure there’s baking science to explain that, but still; I was now without a pie. 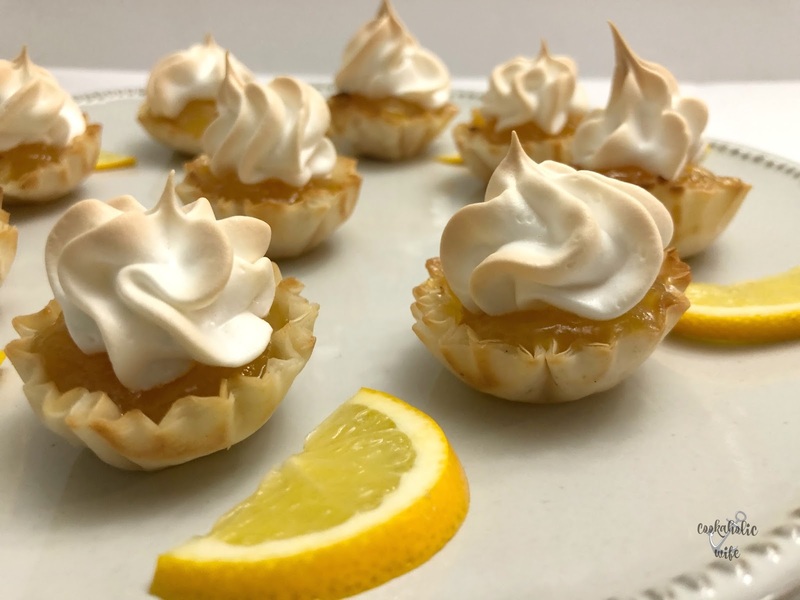 Luckily I had extra curd leftover, but nothing else, so I decided I’d pop in the store and pick up some phyllo shells and make mini meringues. Mini Lemon Meringue Pies are made with a homemade lemon curd and meringue and are served in mini phyllo cups. First prepare the lemon curd, by zesting both lemons. Squeeze the juice from them, adding in an additional lemon if necessary, until you reach ¼ cup. In the bottom pot of a double boiler add ½ cup of water over medium heat and bring to a simmer. In the top pot, add the butter and sugar and stir until melted. Reduce heat to medium low and add in the lemon juice and zest. In a small bowl, lightly beat the egg. Removing the top pot from the heat, pour the egg in while whisking constantly. Return to the heat and increase back to medium. Stir every few minutes until the mixture has thickened enough to coat the back of a spoon. Place a fine mesh sieve over a bowl and strain the mixture through, discarding any solids. Cover the bowl with plastic wrap, pressing it against the top of the curd so a skin doesn’t form and refrigerate for at least an hour. 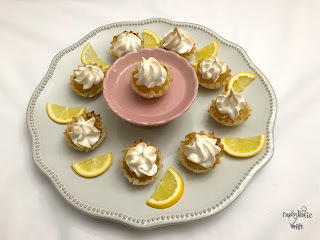 Prepare the meringue by adding the egg whites, cream of tartar and vanilla extract to the bowl of a stand mixer and beating on medium high speed until soft peaks form. Then pour in the sugar, a tablespoon at a time until fully combined. Increase the speed to high and beat until the mixture is glossy and holds stiff peaks. Transfer the meringue to a piping bag fitted with a decorative tip. 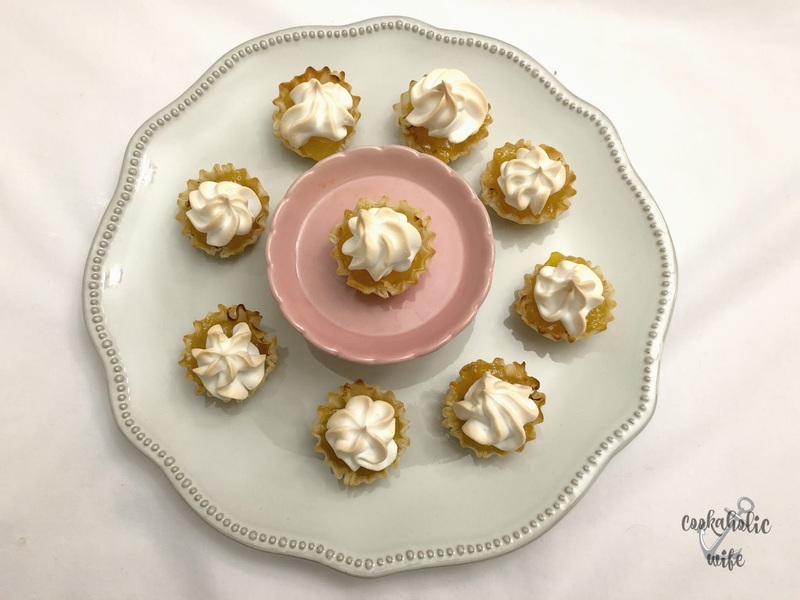 Place the phyllo cups on a baking sheet lined with parchment paper. Add a heaping tablespoon of the lemon curd into each phyllo cup and top with the meringue. Bake for 7-10 minutes or until the meringues are lightly browned. Let cool completely and then refrigerate until ready to serve. Aren’t these mini pies adorable? They’re the perfect bite of sweet and tart and I had a hard time not eating them all myself! Very nice save! I hate baking fails! These are darling. I think the plan B turned out better than the plan A could have been anyway. These are the cutest things! But too bad about the first pie anyway! Ooooo…I have some rhubarb curd AND phyllo dough. This might be on my to-make list tonight. Thanks, Nichole! Ive been looking for a special dessert for a wedding shower Im hosting! I love these are bite sized and they look so special. Looks like Im done looking as Im going to make these! Oooh, these look so yummy! And I love the idea of using those phyllo shells! I love this idea, so cute and tasty! What's better than pie? Bite sized pie! These little bites look like I'd devour more than one for sure.